Born Julian Alexis Jackson on September 12, 1960 in Saint Thomas, U.S. Virgin Islands. Began boxing as an 11-year old and compiled a 15-2 amateur record that includes a win over Livingstone Bramble. Renowned for concussive punching power in either hand, the 5’11 ½” Jackson turned professional in 1981 and scored 29 consecutive victories, 27 by knockout, before challenging Mike McCallum for the WBA super welterweight title (TKO by 2) in 1986. Jackson rebounded to capture the vacant WBA 154-pound title by stopping In Chul Baek in three rounds the next year and reigned until 1990 with defenses over Buster Drayton (TKO 3) and Terry Norris (TKO 2) among others. “The Hawk” became a two-division champion when he captured the vacant WBC middleweight title with a 4th round KO over Herol Graham in 1990. He registered four title defenses, including wins over Dennis Milton (KO 1), Ismael Negron (TKO 1) and Thomas Tate (W 12) among others before losing to Gerald McClellan (TKO by 5) in 1993. Jackson regained the WBC title in 1995 with a 2nd round TKO over Agostino Cardamone. 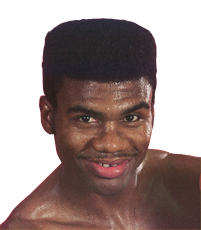 He lost the title to Quincy Taylor before retiring in 1998 with a professional record of 55-6 (49 KOs). With an 80% knockout percentage, “The Hawk” is universally regarded as one of the hardest punchers of all time. In retirement, Jackson became a minister and also trained his two sons, John and Julius.